If sweating less and feeling more confident are goals you have in mind for this summer, then this May Fitness Challenge is for you. It's time to swap the heavy clothes for shorts and flip flops; ditch the couch potato habits to better enjoy fun in the sun. Are you ready? 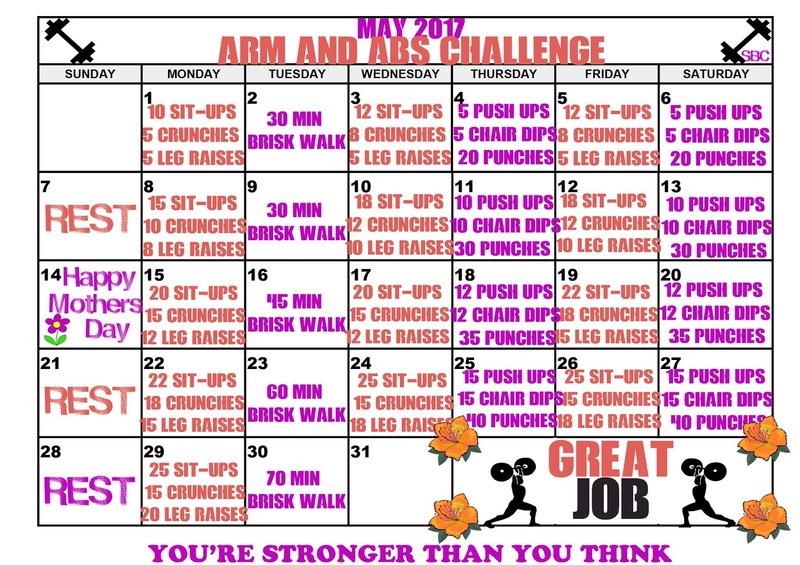 Here are the May Fitness Challenge Calendars and some other tips to help with your health and weight loss goals. REMEMBER: This month is about MORE than just dropping a quick 20 pounds for swimwear and vacation. It's about starting a personal development routine that you can stick with for the rest of the year ... Let's commit to getting healthier once and for all!!! 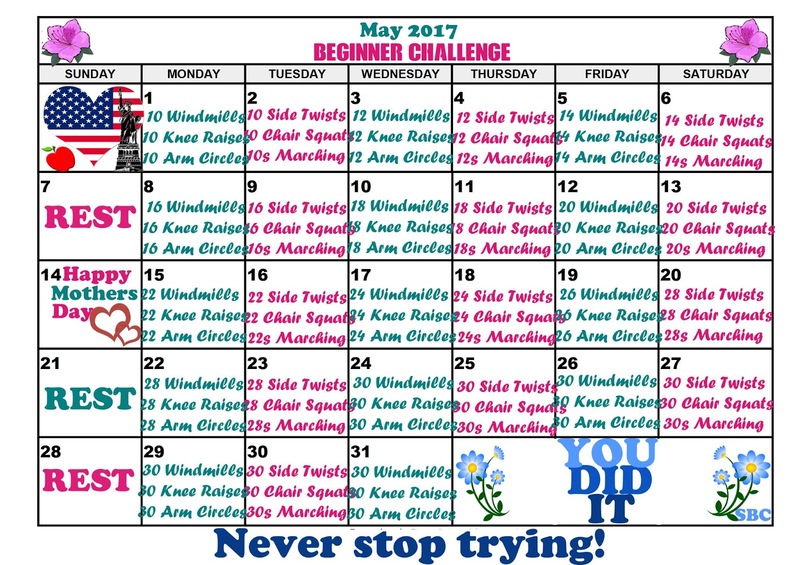 The Beginner Challenge exercises are great for getting back into the swing of things at both a beginner or advanced fitness levels. Do just one set each day if you are a beginner or do more than one set of reps if you need more of an advanced fitness challenge. Click the image to open in a new window to print and use at home. Invite a friend or family member to join you in these workouts each day, so you can remain motivated and do well. Step up your cardio and toning with this Arms and Abdominal Exercise Routine. 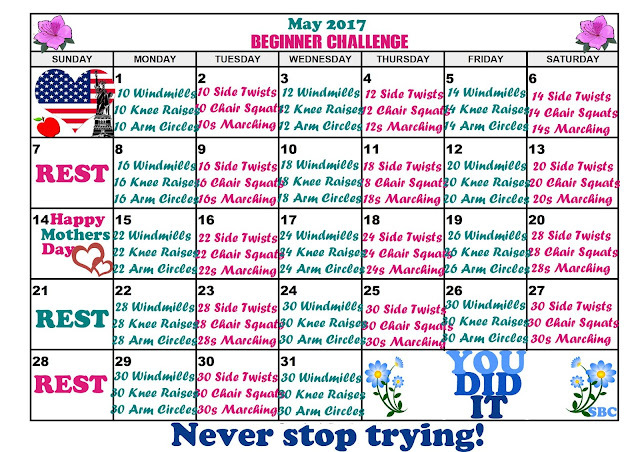 You can do this challenge the same way as the Beginner's Exercise Challenge (one set each day) or double up each days requirement. Most importantly, do whatever it takes to make these workouts fun for you. Invite a friend or family to exercise with you; do them outside on nice days or while at the gym; stay hydrated and eat like you know that you can't out eat a bad diet! EXERCISE DAILY - YOUR WAY! ... and, if these exercise calendars are not enough for your summer body toning needs - OR - if you want to mix it up for more fun, make sure to join our weight loss support group and download one of the images with personal fitness challenges and tips. Make a commitment to become more active in your daily life with more things you REALLY enjoy doing like swimming, bowling, golfing, basketball and so on. Choose activities that you used to do before your weight, finances, health, lifestyle ... insecurities set in and made you stop doing what you enjoyed each day; even if that was simply walking to the store and back. One thing to keep in mind is to pace yourself for the long term commitment and another thing is to remind yourself that each physically active change you make back to your "old self" will help with pain, atrophy, embarrassment, muscle strengthening, body toning, sleep, energy, and so on. Exercise even helps with happiness, so work on increasing your happiness each day! DRINK WATER ... THEN DRINK MORE WATER! 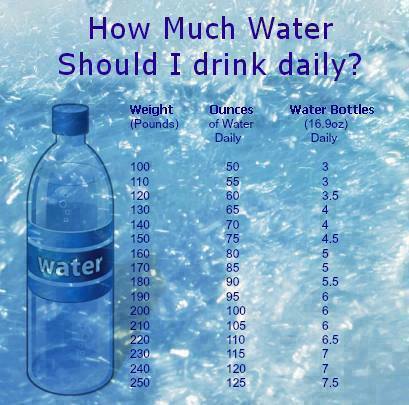 NOT DRINKING ENOUGH WATER can make you gain weight and feel sick. Dehydration causes fatigue, digestive issues, kidney problems, bladder issues, high blood pressure, high cholesterol, asthma, allergies and affect your skin. Dehydration can occur without your even noticing, but usually a dry mouth and sluggish energy are the two easiest ways to determine that you need to drink more water. Prefer other drinks? Try these tips for hydration if you hate to drink water! Eating more leafy green vegetables and low sugar fruits in combination with lean proteins and real whole grains can make a world of difference in your Weight Loss Challenge using Skinny Fiber or Skinny Body Max and HiBurn8. GET QUALITY SLEEP - MAKE IT A PRIORITY! Do you get enough sleep? Have a sleep schedule or do you simply sleep when tired? Are your days and nights mixed up because of work? Do you wake feeling refreshed or not? Can you tell what quality of sleep you're having each night? These are some of the questions you need to ask yourself if you notice dark circles, feel like you need to nap or think that you probably have broken sleep at night. Getting enough quality sleep should be naturally easy, but circumstances or genetics could be interfering with yours and this might be part of why you have gained weight, or struggle with losing weight in general. Pin pointing any issue(s) should be a priority for you. If you know that you have a problem sleeping simple changes like wearing noise cancelling earbuds, a sleep mask or using room darkening window fixtures can help. Exercise, proper water intake and diet also contribute to whether you sleep successfully or not; especially how close to bedtime you partake in any of those activities. There are also natural over the counter supplements like Melatonin or HiBurn8 that help with better sleep and more. Maybe discuss your sleep issues with your doctor, so that you can have one less deterrent to health. Lastly, STRESS contributes to at least 10 correctable issues like obesity, heart attacks, strokes, depression ... Include managing your stress as part of your personal fitness challenge this year. Work on the inside and outside for that perfect summer bod ... Take as much time to take care of you as possible. Therapy or Life Coach can be helpful ... If you've been working hard, then maybe consider using accumulated vacation days for some actual time off. CLICK HERE for more useful tips on how to live a more stress free life for your health.